If you missed the announcement last week, the price of Samsung’s new 8K TV (called the Samsung Q900R QLED) is well, shocking. In the US, the 85-inch version is selling for $14,999, which puts the TV pretty far out of reach for the average home entertainment enthusiast. That said, we just learned the UK price of the screen and it’s pretty affordable by comparison. To that end, you’ll be able to bring home a 65-inch version of the Samsung Q900R for just £4,999 while a 75-inch version can be had for £6,999. Sure, neither screen is as massive as the 85-inch behemoth that’s available in America, but at around half the price, the UK might be getting the better deal with the smaller, more affordable screens. Bummed about smaller screen sizes in the UK? Well governor, the 85-inch is going to be available at some point in the UK, but for now only the 65- and 75-inch versions have prices associated with them. 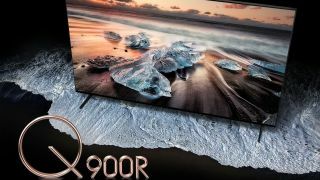 The reason for the ridiculous price tag is that the Q900R is the first widely available 8K TV – one that can not only stream native 8K content, but upscale 1080p and 4K content to 8K as well. That ability to upscale is all thanks to the TV's high-end processor and large image database that uses pattern matching to recognize individual objects on the screen. Once an object is recognized, the processor can go to work optimizing the image, enhancing the quality and reducing blurriness caused by a low resolution. In our review, we lauded the television for this groundbreaking ability - even if that envelope-pushing ability comes at a high cost. That said, while we can't imagine too many homes here in the US will be sporting a Samsung 8K TV in the near future, the forecast looks good for the UK as the more affordable, smaller units start rolling out to store shelves.